Ascaridia sp. 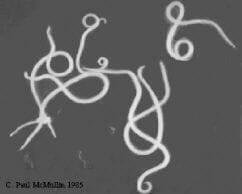 are nematode worm parasites, stout white worms up to 12 cms in length, seen worldwide. The parasite species vary: A. galli in fowl; A. dissimilis in turkeys; and A. columbae in pigeons. The route of infection is oral usually by direct ingestion of the embryonated egg and there is a 5-10-week prepatent period, shorter in young birds. The life cycle is similar to that illustrated in the section on the caecal worm Heterakis, except that the adults reside in the small intestine and earthworms are not significant paratenic or transport hosts. Adult birds can tolerate burdens asymptomatically. The parasites may be transported by grasshoppers and earthworms and are resistant to environmental effects. Wasting, mainly in young birds. Worms up to 12 cm in length in duodenum and ileum. Macroscopic examination with identification of worms, oval smooth-shelled non-embryonated eggs in faeces. Flubendazole, levamisole, piperazine as locally approved. Prevention of contamination of feeders and drinkers with faeces; pasture rotation and regular treatment, especially for young birds. Figure 31. A collection of mature roundworms (Ascaridia galli) recovered from the small intestine of a layer chicken in rear. In the bottom left quadrant there are also some immature worms.